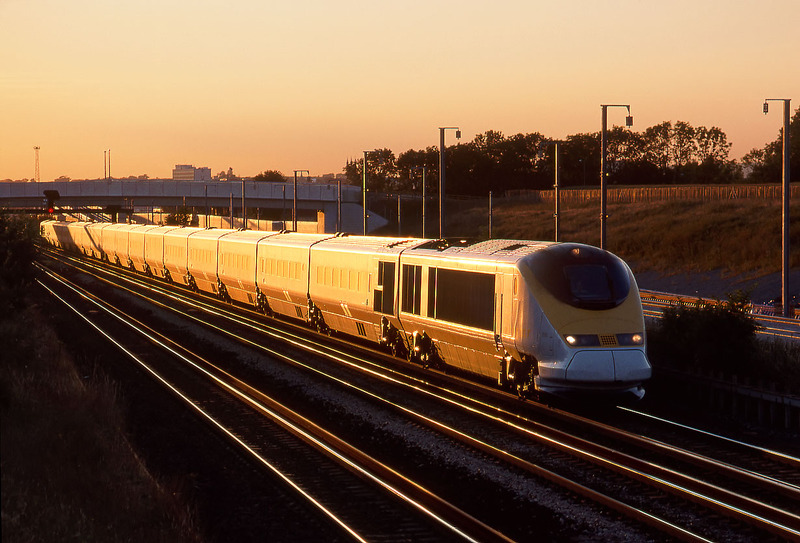 The setting sun turns 3101 golden as it heads past Willesborough with the Fridays only 9O54 19:23 Waterloo to Paris Nord service on 19 July 2002. I was lucky that this train was booked to pass during the relatively brief period when a perfect glint picture could be taken and before the shadows of the bushes on the left would have become a problem. An interesting picture as it shows the new high speed line under construction in the background, with the masts erected but as yet no overhead wires. Soon of course these Eurostar services would be using this new line with the consequent severe reductions in photographic possibilities, not only due to the overhead wires but also due the prominent fencing that would appear in many locations.